Ultimate enterprise firewall performance, security, and control. The all-new Sophos Firewall OS integrates all the advanced networking, protection, user, and app controls you need to stay secure and compliant. Sophos APs are built on enterprise-class 802.11n and 802.11ac chipsets, with custom designed antennas, extra CPU and memory resources and hardware accelerated encryption. Endpoint protection gets personal. It’s personal because it’s all about protecting the end user and not just a laptop or a mobile device. 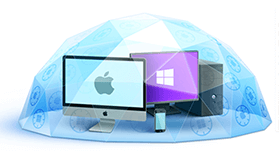 You get everything you need to protect your users, on every device, everywhere they go. And it’s not only personal, it’s easier to buy, deploy, and manage too.